The Jisan Ski Resort, established in December 1996, makes a perfect one-day trip from Seoul. 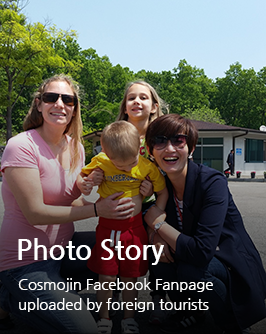 It is located only forty minutes from Seoul City and is covered with beautiful white pines. 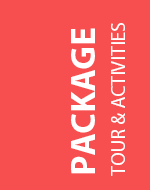 Not only is there a beautiful scenery but there are many other variety of activities to do and see. For example, the Ichon ceramics complex is merely 15 minutes away. At the ceramics complex, they offer many sights to see and ceramic ware experience programs to enjoy. Also, one of the largest Amusement park, Everland and Water Park, Caribbean Bay Island are close by with hot springs complex located near the vicinity. 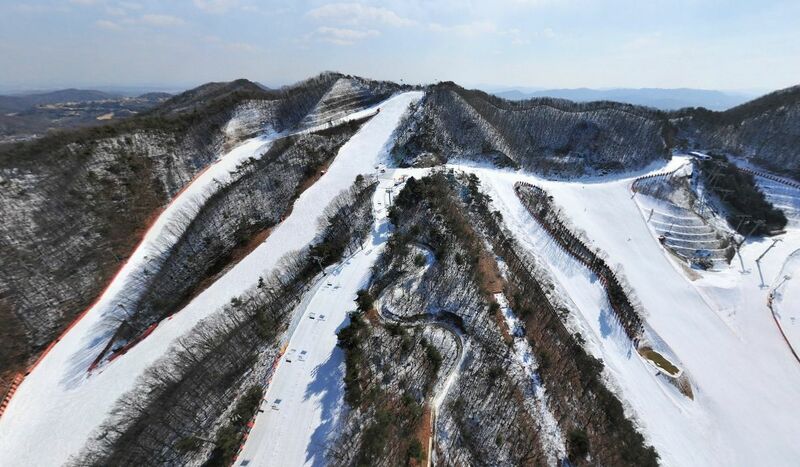 In 1999 a second reconstruction to the resort was completed, opening the 68-room Maple Condo, an intermediate/advanced slope (1.5km), Korea’s first 6-person high speed ski lifts, and adding a world-class half-pipe and half-pipe ski lifts. These renovations elevated Jisan Ski Resort to one of the best leisure complexes in the metropolitan area. The Jisan Ski Resort’s state-of-the-art snow management system works to overcome the weather near the Seoul area and sustain great quality snow. The Jisan Ski resort is a great getaway for the entire family with its variety types of slopes to ride. The Resort also offers nighttime skiing for businessmen and is perfect for beginners. The Jisan Ski Resort is surrounded by many beautiful pine trees in its forest. Only being 40 minutes away from Seoul, the resort offers a great atmosphere for nighttime skiing. It has a conveyor belt for first time skiers and for beginners, a special avec course for couples, and many more. All slopes are open to snowboarders, and there is a special ski slope reserved for ski lessons with a mild slope of 3 degrees. Icheon Pottery Village, Icheon SpaPlus, and the grand theme park Everland are all located less than half an hour away. Yongpyong Ski Resort is located on Mt. Barwangsan and it is one of the biggest ski and snowboard resort in Korea with the largest ski slopes. The Yongpyong Ski Resort is located at a very inhabitable range of 700 meters above sea level and is found at the eastern edge of Asia, about 200km from Seoul, the capital city of South Korea. The Yongpyong Resort is a 2-hour car drive away from Seoul, but the resort runs shuttle buses from Seoul during the peak season. Visitors traveling from the Daegu and Yeongnam regions can take the Jungang and Jungbu Inland Expressways, and arrive at Yongpyong Resort within three hours. Pyeongchang, Gangwondo province having an annual snowfall average of 250cm, the surrounding area possesses a beautiful environment, which allows for the enjoyment of a wide array of winter sports including skiing from mid-November to early April. On its 4,300 acres, you will find a 45-hole Golf course, 31 ski slopes, premium hotels, European-style condominiums and many other leisure facilities that can be enjoyed by the whole family. Alpensia Ski Resort has six slopes for skiers and snowboarders to enjoy. Runs as long as 1.4km provide a dynamic experience for both beginners and experienced skiers and snowboarders. There is also an area exclusively for advanaced snowboarders to practice their skills. The ski runs are all serviced by chairlifts and are named: Alpha (beginner), Bravo (beginner/intermediate), Charlie, Delta, Echo and Foxtrot catering for intermediate ability. All slopes are closed between 4:30pm to 6:30pm each day for piste-maintenance. Night skiing is available from 6:30pm to 10pm. 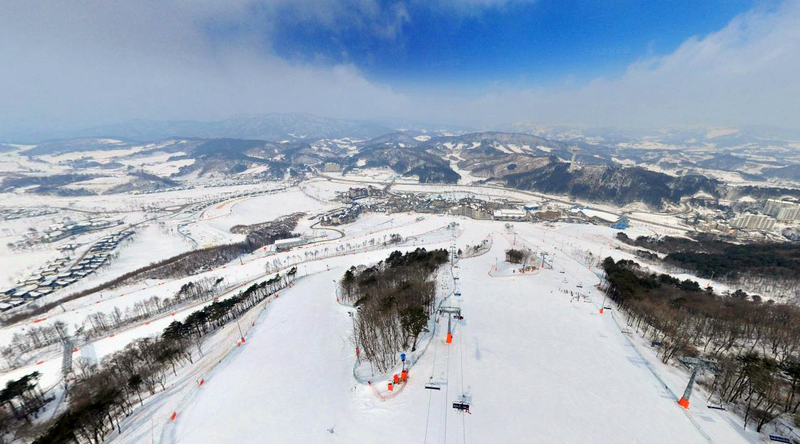 Alpensia is only a 5-10 minute car ride to the more extensive Yongpyong korea Ski Resort which has a full range of runs. In the resort village are 3 main accommodation providers - Intercontinental Hotel, Holiday Inn Hotel, and Holiday Inn Suites. alpensia ski resort price is flexible. The Alpensia Ski Jumping Stadium is located within the station and will be the location of the ski jumping events of the 2018 Winter Olympics. Alpensia will be the focus of the 2018 Cultural Olympiad, with a new, purpose-built concert hall within the resort. Alpensia is not just for winter revellers: the year-round resort transforms the lower, Apron Area, of the mountain into a 100,000㎡ wild flower garden during summer months. Yangji Pine Resort, located at the foot of Mount. Dokjo next door to Yangji IC of Youngdong Highway a distance of 40-minute drive from Seoul, is a all-season-round complex resort well matched with natural endownment of beautiful mountains and luxuriant forest. Yangji Pine Resort is equipped with an international scale 27-hole golf course surrounded with exuberant pine grove, a super-modern ski ground having 6 lifts supporting slopes for seven-grade skills. Yangji Pine Ski Valley of 90-acre scale has 6 lifts supporting 7 slopes from gentle to steep, state-of-the-art automatic snow-making and snow-tiding facilities for comfortable skiing and maintaining best snow condition, and each slope is equipped with light for the safety of skiers and for enjoying extraordinary charms of night skiing. The resort also offers a mogul ski course for experts and thrill seekers as well as ski and snowboard lessons. Newly opened is the Challenge Plus Course as well, for intermediates and above. The rest area, observatory and sledding slope provide a well-rounded family experience.